The U.S. refugee resettlement program is facing unprecedented challenges, between the steep drop in refugee arrivals since fiscal year 2016 and reduced funding for reception and placement services. Some local resettlement offices have been forced to close, while others must figure out how to do more with less. As a result, it is more important than ever to think smartly about how to support refugee integration, including by forging new partnerships and improving the accessibility of mainstream services. At the same time, human service agencies across the United States have shown a growing interest in “two-generation” strategies built around recognition of the fact that addressing the needs of children is important to their parents’ success, and vice versa. This report examines how this approach could be—and in some cases, already is—applied to support the integration of refugee families. Such a strategy may include programs that explicitly serve both adults and children, as well as those that focus on one or the other group in a way that supports the advancement of the whole family. The report's findings draw on interviews with voluntary resettlement agency staff and with state refugee coordinators from ten states, site visits, and a roundtable that brought together practitioners and experts in two-generation models, early care and education, school-age refugees, and refugee employment services. A two-generation lens, the authors conclude, opens a number of avenues for supporting refugee families in ways that go beyond rapid employment, the traditional focus of U.S. refugee resettlement programming. Among the promising models identified are trainings to help refugee parents become licensed child-care providers, integrated English instruction and workforce training to help parents find higher-paying and more stable work over time, and services that support mental health and combat social isolation. Crucially, the report also lays out concrete steps that federal, state, and nongovernmental actors can take to implement and scale up two-generation approaches, even without additional funding. This useful data tool provides the annual resettlement ceiling set by the President in consultation with Congress for refugee admissions to the United States since the start of the U.S. 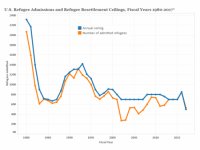 Refugee Resettlement Program in 1980, as well as the actual numbers resettled by year. This feature presents the latest, most sought-after data on immigrants in the United States—by origin, residence, legal status, deportations, languages spoken, and more—in one easy-to-use resource. These MPI research and data resources offer context related to the issues addressed in President Trump's executive orders on immigration as well as policy changes achieved and proposed via other mechanisms and the populations they will affect.